WHITEHORSE, YT – Yukon Brewing has announced the release of a new limited edition beer inspired by one of the world’s most famous paintings. 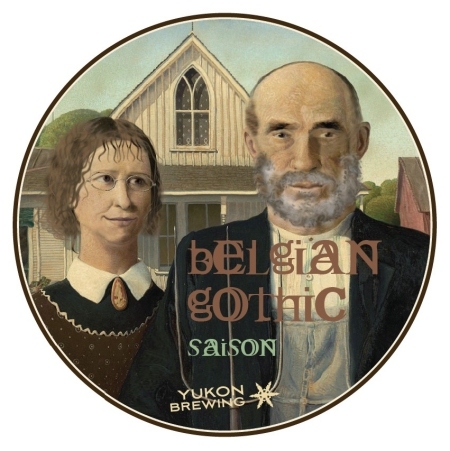 Belgian Gothic Saison features a name and tap label that pay homage to Grant Wood’s American Gothic, with Belgian-born Yukon employee Pascal Broeckx serving as the model for the farmer in the painting recreation. A Saison was traditionally brewed in Belgium in the fall or winter for the consumption of the farm workers the following summer. The ‘saisonnieres’, or seasonal workers, were allowed 5 litres per day, just to keep that pesky thirst away. Our version is a wee bit spicy (we use cracked peppercorns in the brewing), a wee bit fruity (we hand peeled oranges and grapefruits, then pounded up the fruit and put the whole messy affair into the kettle), and definitely thirst quenching. We are not necessarily recommending 5 litres per day, but you might be tempted. Yukon Belgian Gothic Saison is available now in growlers at the brewery store, and in bottles in Alberta, where it is the 7th instalment in Yukon’s A.D.D. Series of limited edition releases.